Finasteride - Mad Gender Science! I'm growing pretty concerned about finasteride. It seems to increase the risk of high Gleason-score (aggressive, dangerous) prostate cancers, even though it reduces the risk of low-grade ones. In fact, it was unanimously rejected by the FDA for treatment of prostate cancer. The 5α-reductase enzyme is responsible for the production and lifecycle of many crucial neurosteroids such as progesterone and allopregnanolone. Finasteride blocks this enzyme. In trans health, finasteride is used to block the metabolic conversion of testosterone to Dihydrotestosterone, which has a higher binding potency. Unfortunately, the machine that finasteride *breaks* is how these natural, mind-helping steroids are produced and interconverted! There are only three brands *(isoforms)* of this enzyme. Each has a different structure, and plugs into different things with different adapters. Since finasteride blocks 5-AR forms 2 and 3, the cells decide to replace it with 5-AR form 1 instead. This is really bad news, because that isoform *simply wasn't designed* to work in those other gene regulatory circuits! This could be the reason behind PFS and the increased cancer risk. 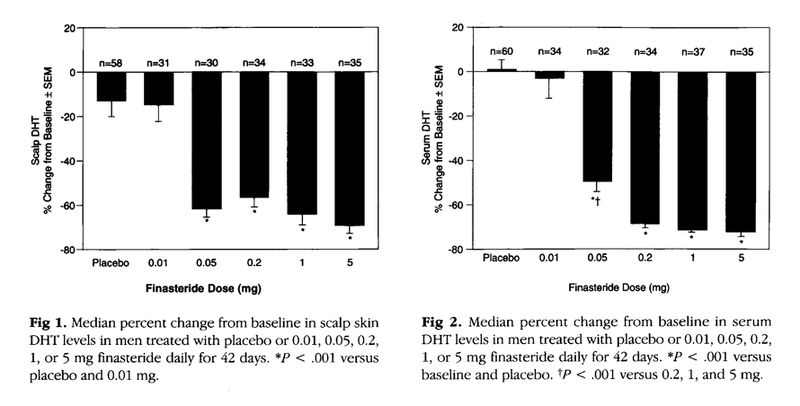 Finasteride has demonstrated long-term effects well after discontinuation, so this may even be *irreversible. * Isoforms 2 and 3 don't get manufactured again once you withdraw the drug. Your cells keep churning out isoform 1! As a result decreased DHT levels, PSA levels are also decreased by about 50%. ↑ Joseph M Unger et al (2018). "Using Medicare Claims to Examine Long-term Prostate Cancer Risk of Finasteride in the Prostate Cancer Prevention Trial". JNCI: Journal of the National Cancer Institute. 110 (11): djy035. doi:10.1093/jnci/djy035. PMID 29534197. ISSN 0027-8874. This page was last edited on 29 October 2018, at 02:28.